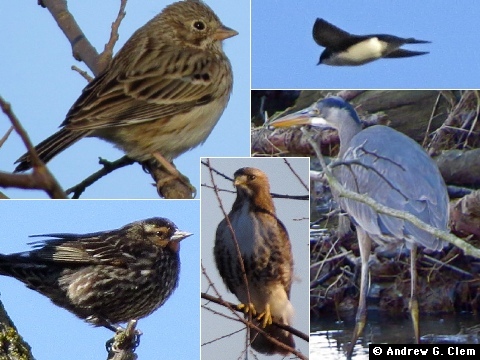 A diary of birds I've observed, spiced up with photos and occasional commentary. 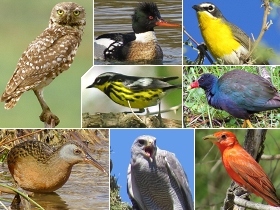 Clockwise from top left: Burrowing Owl, Red-breasted Merganser, Yellow-breasted Chat, Purple Gallinule, Summer Tanager, Gray Hawk, Virginia Rail, and (in center) Magnolia Warbler. 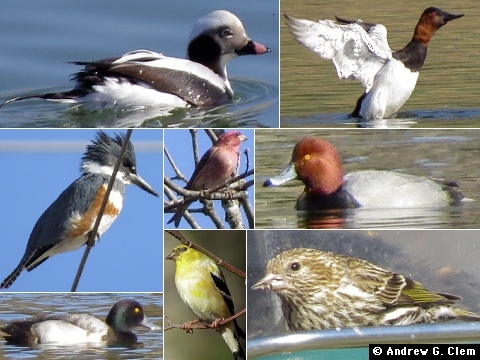 Captions identifying the birds in these photo montages are found on the Wild Birds intro page. DESCRIPTION : UK based wild bird food shop and garden bird feed supplier offers quality bird treats which include garden bird seed and garden bird food like seed mixes, suet coated peanuts, suet coated sunflower hearts, dried earthworms, seeds with insects and suet pellets with fruits and berries. 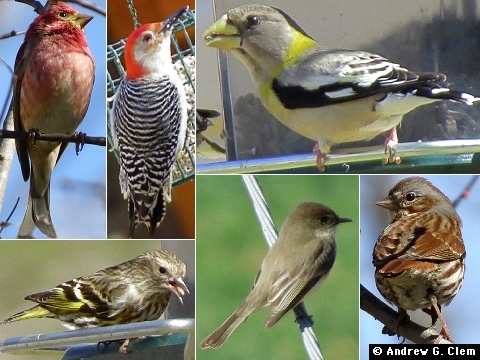 My overall impression is that most migratory birds have been arriving a little behind schedule this spring, but others may have had different observations. On March 23 to Bell's Lane I was pleased to see the Loggerhead Shrike on Bell's Lane for the first time since February 6 (see March 18), on the very same line of fence posts, in fact. Three days later I went back in hopes of seeing again (twice, in fact), but no luck. I did, however, see a Vesper Sparrow, another pleasant surprise. I had seen them there twice last fall, likewise a rather unusual sighting. Tree Swallows were flying around, the first time I had seen them this year. 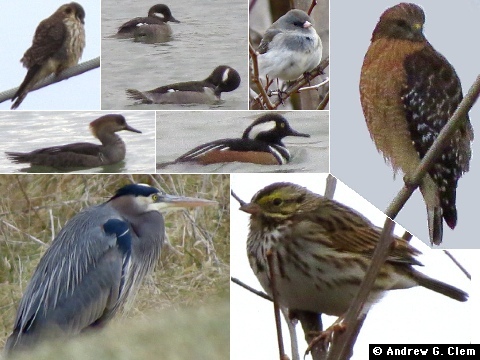 CLOCKWISE FROM TOP LEFT: Vesper Sparrow, Tree Swallow, Great Blue Heron, Red-tailed Hawk, Red-winged Blackbird (F), on Bell's Lane, March 26. 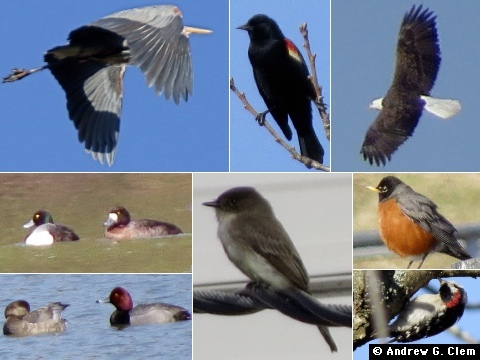 On Saturday March 30 I led an Augusta Bird Club field trip to Augusta Springs, in the western part of Augusta County. To my surprise, the turnout was quite large, with at least a dozen people in attendance. Soon after we began, I heard a strange whistling song that reminded me of a Killdeer, but I had no idea what it was. Then I spotted the singing bird at the top of a small tree, and was astonished to realize that it was a Rusty Blackbird! I had seen a flock of those along the Middle River on last November, when it had the "rusty" non-breeding plumage, and this was the first time I had a clear view of one in breeding plumage. Then I heard a Louisiana Waterthrush singing, so we reversed course along the boardwalk trail, going counter-clockwise in pursuit of it, but without success. We did, however, have a nice view of some Yellow-rumped Warblers. (I hardly saw any of those during the past winter.) 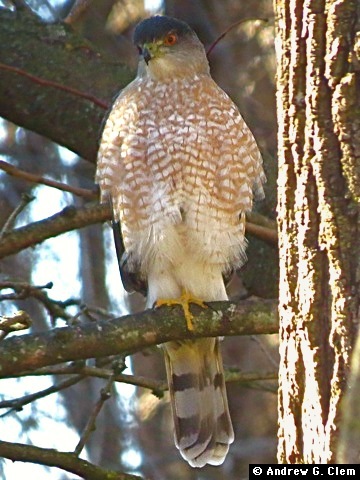 Other highlights of the morning included Yellow-bellied Sapsucker, Wood Ducks, Pine Warbler, Red-breasted Nuthatch (heard only), and a Sharp-shinned Hawk. On the way back to Staunton somd of us stopped at the Falls Hollow trail head, east of Elliott Knob. We didn't see any birds there, so we continued to Swoope, where we saw the new Bald Eagle nest, about a mile southwest of the one in the tree that was blown down in a storm last November. All in all, it was a wonderful day of birding! 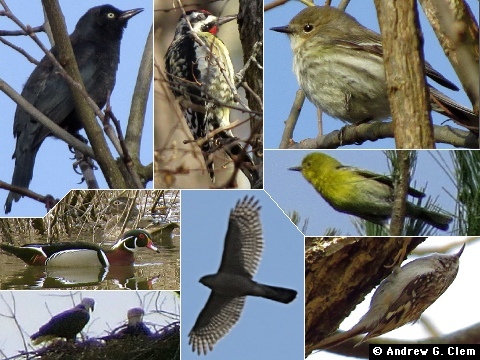 CLOCKWISE FROM TOP LEFT: Rusty Blackbird (M), Yellow-bellied Sapsucker (M), Yellow-rumped Warbler, Pine Warbler (M), Brown Creeper, Sharp-shinned Hawk, Bald Eagles, and Wood Duck (M), on March 30. Except for the Bald Eagles (in Swoope), all others were seen at Augusta Springs. I didn't get out much during the first week of this month, but I did get a nice closeup view of a male Pine Warbler in the Big Levels area on April 6. Five days later (on April 11) I went to Bell's Lane, where I had nice views of several birds, including Goldfinches in breeding plumage. Then I went to Mill Place in Verona and saw two Savannah Sparrows close by. On Saturday April 13 (Earth Day!) I went to Montgomery Hall Park, but didn't see much other than an Eastern Towhee until just before I was going to leave then I spotted a flycatcher of some kind in nearby tree tops, and soon determined that it was an Eastern Kingbird, my first one of the year. Later that day on Bell's Lane, I had two other first-of-year birds: Blue-gray Gnatcatcher and Brown Thrasher. 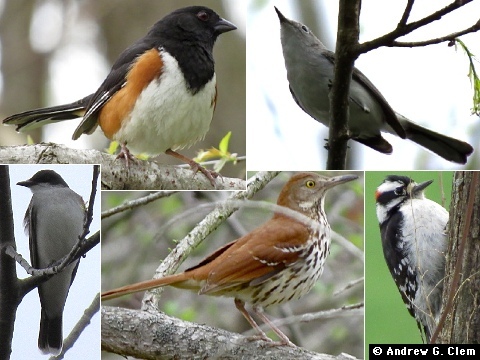 CLOCKWISE FROM TOP LEFT: Eastern Towhee (M), Blue-gray Gnatcatcher, Downy Woodpecker, Brown Thrasher, and Eastern Kingbird, April 13. 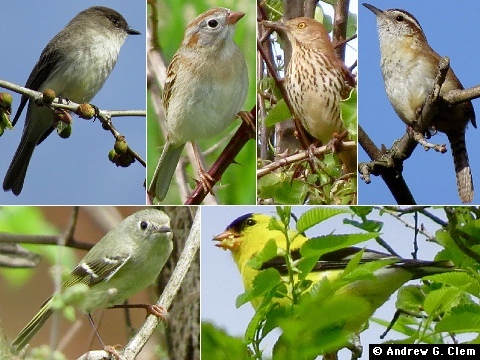 CLOCKWISE FROM TOP LEFT: Eastern Phoebe, Field Sparrow, Brown Thrasher, Carolina Wren, American Goldfinch (M), and Ruby-crowned Kinglet; on April 17. 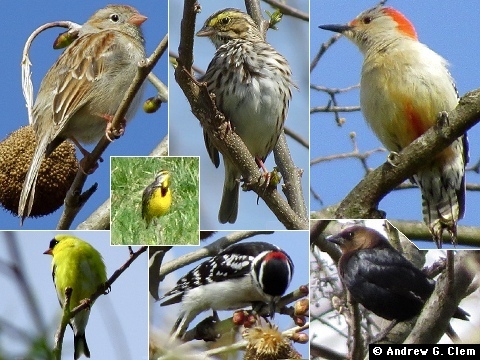 As usual, more photos can be seen on the Wild Birds yearly photo gallery page. In about five minutes, I'm going to lead a field trip to Dowell's Draft, in western Augusta County! 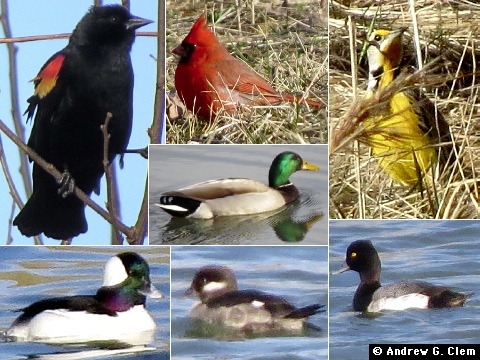 To see previous blog entries, go to the Wild Birds archives page.